It's certainly an interesting enough back-story: Actor Ryan Gosling and Zach Shields form the band after canning plans to do a musical monster/ghost love story for the stage. When they realized how much money the whole thing would cost they decide skip the play and keep going with the music part of it. To be honest, whenever an actor decides to start making music, it's usually horrible. There are certain exceptions (although I'm having problems thinking of many other than She & Him and, of course, This) but overall it's pretty consistent. 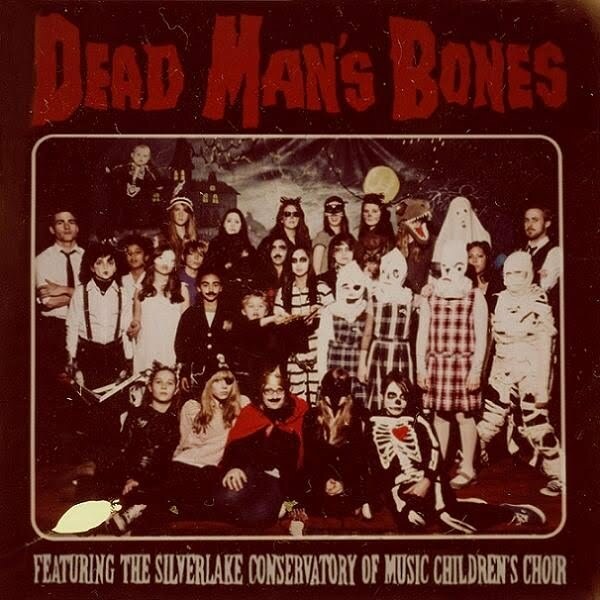 When details began to surface about the Dead Man's Bones project and the addition of the Silverlake Children's Choir it began to sound more and more intriguing. I'll admit the band name, album concept and early October release date make it all seem a little like a holiday album. Something that will be fun to bust out a few times before Halloween each year. It will be that album too and there is nothing wrong with that. After spinning it at least a dozen times in the past few days I'm seeing that after the cuteness wears off there are some fantastic songs in here. The Children's Choir will really be a make or break point for a lot of people on this album. I was hesitant about a choir too until I actually heard it. The kids really do add a lot to the songs and they never overshadow any of the album. I've included a few of the best songs below from the record. You'll see the band is a bit all over the map with their style. 'My Body's A Zombie For You' sounds like Arcade Fire making a Halloween tune and should be on every Halloween mix from here on out. Dead Man's Bones proves to be more than an actor delving into the music world as Ryan Gosling and Zach Shields really did end up putting out an overall great album from start to finish. If you want to get this, make sure you get it before Halloween, but I'd imagine it will get plenty of play afterward as well. Today I picked up Dead Man's Bones. And I gotta say, I really like it. It's actually quite a beautiful album. I also picked up Embryonic by The Flaming Lips. And this album (to my surprise) is much more haunting than the one mentioned above. I read a quote by Wayne Coyne describing the album as "Miles Davis meets Joy Division". One more thing, it's about bloody time drummer (Lawrence's own) Kliph Scurlock got some liner note love. His contribution to the band has now reached its decade mark and he's just now getting recognition?!?! I'm not sure exactly what it is about the Dead Man's Bones album, but it's for sure one of the surprises of the year for me. I'm digging the new Lips one as well, I'm especially enjoying the return to psychedelia form. I also read an interview with Kliph today and this is the first album he's actually recorded with Wayne & co. Previously he's just been the touring drummer. Nice to see him be a more official member now.